In May 1998, George Chavis, along with his wife Domergue, began to carry out the call that God had placed on their lives, which was the birthing of Greater Grace Ministries, a Non-Denominational Church in Suffolk, Virginia where George is the Senior Pastor and Domergue is Co-Pastor. In April 2009, God moved the congregation to Norfolk, Virginia. The vision of the Ministry is to build the lives of people through the teaching of God’s Word, thus making disciples for Christ. Before birthing Greater Grace Ministries, George was trained for the ministry at Rock Church of Virginia Beach, Virginia under the leadership of Bishop John Gimenez and Pastor Anne Gimenez. He served in the ministry as a deacon and was involved in the prayer, prison, teaching and hospitality ministries. Pastor George was also involved in the praise and worship ministry. He attended the Rock Bible Institute and completed two years in the study of Theology. Pastor George flows in the prophetic and preaches the uncompromised Word of God with God’s authority. His call has been sealed by the Holy Spirit. The anointing is upon George to preach the Kingdom of God to mankind with signs and wonders following. 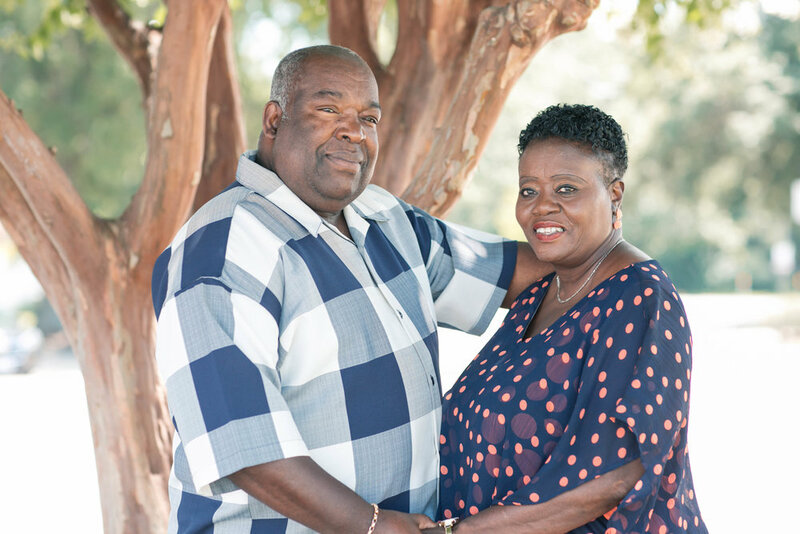 In May 1998, Domergue Chavis, along with her husband George, began to carry out the call that God had placed on their lives, which was the birthing of Greater Grace Ministries, a Non-Denominational Church in Suffolk, Virginia where George is the Senior Pastor and Domergue is Co-Pastor. In April 2009, God moved the congregation to Norfolk, Virginia. The vision of the Ministry is to build the lives of people through the teaching of God’s Word, thus making disciples for Christ. Before birthing Greater Grace Ministries, Domergue was trained for the ministry at Rock Church of Virginia Beach, Virginia under the leadership of Bishop John Gimenez and Pastor Anne Gimenez. She served in the ministry as a deacon and was involved in the prayer, teaching and hospitality ministries. Pastor Domergue Chavis has a passion for women and wants to offer them hope. She passionately articulates God’s truth in a way that truly impacts lives. She takes her empowering messages nationally speaking at various conferences, seminars, workshops and churches, encouraging and challenging women of all ages, on how to discover a life-changing intimacy with Jesus. Pastor Domergue Chavis was born in Norfolk, Virginia. She and her husband are the parents of two children, Michal Elizabeth and Zachary James (husband of Tara Chavis). Pastor Domergue and Pastor George are also proud Grandparents to Harper Avila and Noah Daniel. The family resides in Virginia Beach, Virginia. She has a BS Degree in Biology from Norfolk State University, Norfolk, Virginia. Pastor Charles and Pat Minor are Associate-Pastors and well-trained ministers that teach the the Word of God not only with Godly wisdom and faith but with works! Pastor Charles and Patricia Minor share the same vision as Pastor Chavis, to build the lives of people through the teaching of God’s Word. They lead our Nursing Home ministry as well as our Counseling ministry and Education ministry. Pastor Minor is also incredibly gifted on the piano and often has the opportunity to bless us with songs during praise and worship. Associate Pastors Terri & Linda Gilchrist both share an alluring passion for bringing the love of Christ to those behind bars. As leaders for our Jail Ministry and with a powerful testimony, we have witnessed the saving of souls from the light that they have brought into a dark place. The Gilchrist's are also faithful volunteers for the Salvation Army, Follow-up Ministry, New Member ministry, as well as the following ministries: Hospitality, Bereavement, Visitation of the Sick and Shut-In. Their desire to do more represents that of the Body of Christ as Greater Grace Ministries. Associate Pastors Calvin and Carla Oglesby are blessing us by their leadership and their faithfulness as they take the reigns with out Altar Work Ministry, Prayer ministry, and lead the Greeters of Greater Grace Ministries. Their unity as husband and wife blesses us as well as their obedience to hearing the Lord and what He has planned. The Lord spoke to Pastor Oglesby to lead the body in corporate prayer, and we have been faithfully doing so every first Saturday of each month. We have been praying for specific ministries, such as our praise and worship ministry and our nursing home ministry, and fervently praying for those who have a desire to serve to be drawn to each ministry. We look forward to seeing God continue to do great things for and with them.